New Bern, NC Bojangles'® Tands, INC. Store #35 - Bojangles'® / Tands, Inc.
For the best fried chicken in New Bern, NC, visit Bojangles’®. We are famous for our Cajun-style chicken dinners with sides like Cajun Pintos®, slaw and our made-from-scratch buttermilk biscuits. 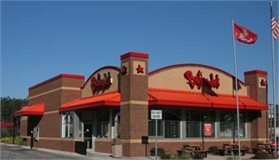 From the time Bojangles’® opens early in the morning until we close, New Bern customers visit us for a fast and filling breakfast, lunch or dinner. Our New Bern Bojangles’® location is on Martin Luther King, Jr. Blvd near New Bern High School. We are always rootin’ for the Bears, and our restaurant is always a popular hang out for Bears and their fans!